» I am having a change of heart lol ... AKA I miss my Omen. » One of the Last Omens! After 6 years I got one! Finally got some of the parts I have been wanting like the AM2+ motherboard so I can use the phenom x 3 cpu and 6gb of ram from the old HP of my sons. Got a AM3 build going on and have everything for it except still deciding on what Phenom 2 CPU to snag. And that lead me to start looking for parts for my other build. I am looking a a mini itx build for a portable gaming rig. Some of those mother boards are as small as 6.7" x 6.7". I am going though those boards right now deciding on what to get and as usual it's your basic AMD vs Intel. As always I lean toward AMD but they only have their FM2 available in that size. I can get the x4 core for around 100 bucks. The cheaper intel chips are all i3 with price jumping way up when you hit the i5 series. At least I think I have found the perfect traveling case. Even at that size it has a full ATX power supply. Any of you seen this case? Still researching right now. I see I can do some gaming even Skrim with out a dedicated GPU with the FM2. Plans call for SSD as the main card and 320 to 500 gb 2.5" drives. ATX modular power supply. Will need some airflow mods if I use that case. I will have to keep the one you have in mind. Have to mock up a box and see if it will all fit when I get home. If I can I want a 7770 double wide card. We are really cut back on weight on the chopper, or I would just bring a regular small one. Trying to get it all to fit in a pelican case. Not looking for 1920 plus resolution. May even just using video glasses to save weight. The old lian li cases such as the omens, v1000, v2000 etc were all really nice quality cases. I saw one of the newer lian li full tower cases in microcenter and it was made of extremely thin metal I was not impressed at all and I thought to myself the quality had really gone down hill. Maybe that was one of there cheaper models idk. I may try a even smaller case to see how it goes with out a dedicated graphics since I won't be pushing max resolution. Then if it needs it for what I want get the slightly bigger case and add a 7770. I have a alienware m11x R1 but will need something for newer games. I really hate that they discontinued the 11x. Just pulled the trigger on this, we will see how it goes. Decided to try this case, airflow looks good. Just needs a phoenix sticker on the front or something like that, lol. Provided everything is in order when it arrives I have a customer lined up for it. No io shield but that shouldn't be a deal breaker. I also picked up a first gen i7 930 but haven't picked out a motherboard yet. Kind of swapping out some systems at the house, lol. Maybe by this time next year everything will be quad or higher, lmao. I see there is one shield on ebay, but 25 bucks for just the shield???? My oldest boy just seen the list of all the pc stuff on ebay and newegg I got. He is calling dibs on the i7. Told him he couldn't have the i7 and Phenom 2 x 6. I see I will have to lock it up when it comes in, and when I go to work, lol. He wants dibs on a 930? I feel like the 960 in the omen is dated. Also if you are looking for a board would avoid evga. I have not had a good experience with any evga product. The closet is the x58 ftw3 i am currently using. They really drop the ball on bios updates. I had to wait forever for them to release a bios that didn't power cycle my entire system upon boot with VT enabled. Id recommend gigabyte ecs or msi based on past experience. I am looking at multi monitor stands now for my desk. The abundance of large lcd panels around here got me thinking. Case came in today, just waiting on the rest of it now. I snagged a used motherboard on ebay for the i7. One like this for 60 bucks. The industries sporadic adaptation of wlan is confusing me. I would have thought onboard wlan would be mainstream by now but still most boards do not offer it let alone come with it standard. I expected to see it on that asus as many of asus line have it. If you are looking to do anything with core 2 I used an ECS G41 a while back and with just 4gb of kingston ddr3 the thing flys. I only have two core 2 duo desktops, the oldest boys old dual core 2.4 optiplex. His first upgrade from a single core emachine, then I just got a 2.8 core 2 duo to update the desktop I got a while back. The mother board can handle core 2 duo but has a pentium D in it. I have a lian li cage for this but it is not hot swappable. Now if only these would come down in price. Would be sweet to have 6 of them in hot swap rack. i5 arrived today and seems to run great. Just waiting on the drive now and it will be ready to deliver. Ended up recycling a systemax microatx case. 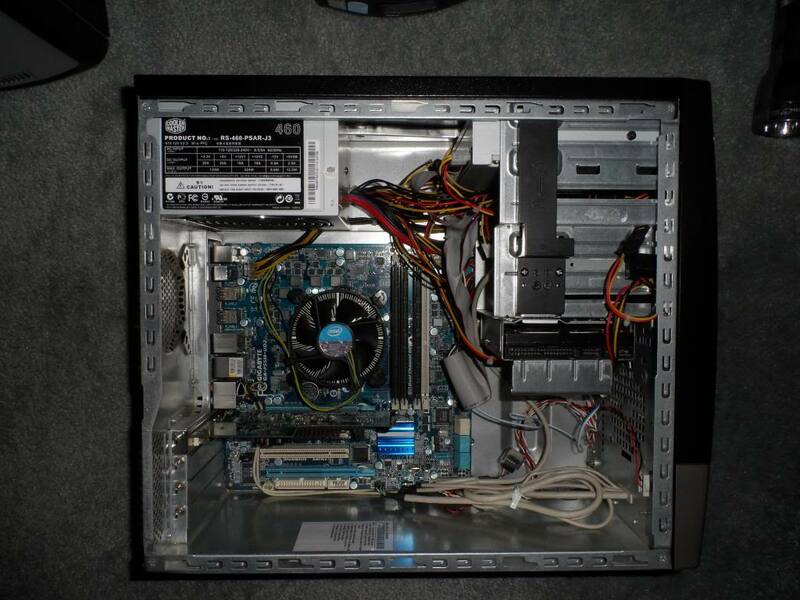 Suits the build well other then the fact I had to tuck the atx 24 pin in order to fit the hdd cage in the case. Wiring is still a bit ratty but I will take care of that when the ssd arrives. Mine came in yesterday, later today I will see if I can find the time to put it together. That is pretty much how it currently sits. Will probably be delivered by this coming Saturday. Found out yesterday that this is the famous hackntosh motherboard. I will probably end up with it again since I dispose of this clients old systems as well so I can play with it as such once it is completely obsolete. Fingers crossed it does not fail before then. Did a deal today that landed me an almost new brother hl-2240 almost for free. Got everything put into mine but the power supply. (yes photos coming soon). Should get it finished up today and load Windows 7 on it. I got side tracked when the ex-brother in-law came in to visit. He had purchased his first new gaming desktop to build and still didn't have it working. He was thinking the motherboard was dead. I went to look it over didn't see anything visibly wrong. So I started to put it back together as he had taken it back apart to send the board in. When I started to screw in the motherboard spacers he said what are you doing? I am putting the spacers in. Long story short he was grounding out the motherboard by screwing it directly to the case with out any spacers. His first motherboard was a larger two X 16 PCI slot board. It was damaged and told it couldn't be fixed. Don't know if it was that way when he got it or if he screwed it down and it grounded out. Anyways it's working now, lol. Guy I knew was screwing the board down using some kind of o ring type thing around the screws not allowing the board to properly ground, Needless to say that board died within 1 hr of installation. On another side note I have to dig up an intake and exhaust fan for the i5 build. Going to mount the ssd when it arrives where the pata drive is now with the connectors facing the backwall of the case to maximize side panel clearance. Loading windows 7 64 bit on it now. I put the big cooling fan on the power supply toward the motherboard because I didn't have any of the 10 MM fans to put in it. Should help cool it down. Using the stock cooler, but looking for low profile aftermarket one. Added 80GB SSD and 320gb hd. You see how much room I have with the stock cooler. Any one got any good recommendation on a low profile cooler to order? What programs do you want to see for benchmarking. The case is a lot better quality than I thought it would be. I have had it together and apart several times test fitting, deciding on what power supply. Going to see how far I can push the on board graphics then maybe decide on a different card. My GTS250 won't fit, it's too long for the case.